Our family just happens to know quite a bit about Asian countries and cultures because both of my children are Asian. They were adopted from South Korea so we attend the Asian festival in Tulsa every year. We also have many friends from several different Asian countries. Although we know a lot it was still fun to learn more. We had fun exploring Vietnam but Laos, Bangladesh, Nepal, China, and Iran are all countries that are included in this unit study. Each country study starts off with a story and then some discussion questions. Next, is the Let's Talk about...(whatever country you are studying). This goes over the history of the country, what life is like for Christians, and then a fun activity like a puzzle or mapping. Each unit is pretty short but packed with a lot of information. Since my children are in 6th and 8th grades we went to the library and found several books that went along with each unit so we could extend the study. 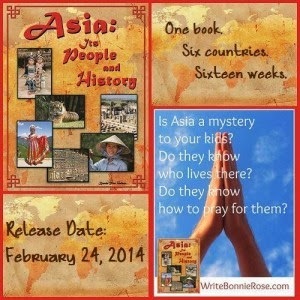 The author is Bonnie Rose Husdon, she writes for The Old Schoolhouse Magazine® and SchoolHouseTeachers.com as a curriculum creator and editorial assistant. Her heart’s desire is for every child to feel the love of God and know how special they are to Him. She would love for you to stop by and meet the star of her children’s series at Exploring with Jake (http://writebonnierose.wordpress.com/), look through the 10/40 window of the world and join others in prayer at Looking Out the 10/40 Window (http://lookingoutthe1040window.wordpress.com/). I get to giveaway 2 PDF copies of the book. 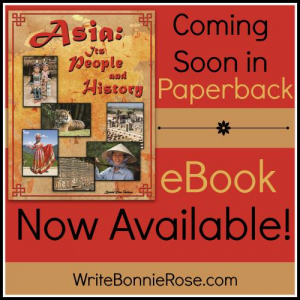 To enter, simply leave a comment as to which country you’d like to see included in Volume 2 of Asia: Its People and Its History. The Schoolhouse Store is offering my readers 25% off through 3/15/14 PROMO CODE: 02asia14!